Reading, 30 April 2015, UK insurers are failing to deliver multichannel customer service to customers and prospects, answering just 40% of routine questions asked via the web, email and Twitter. The 2015 Eptica Multichannel Customer Experience Study found that while email performance has improved since 2014, finding answers to questions on insurer websites has become more difficult and Twitter response rates have remained static. 50% of questions were successfully answered via email, 40% on the web and 30% on Twitter. This means that despite the fact that the vast majority of consumers are now researching, buying and updating their policies online and through digital channels, most insurers are not providing adequate customer service on these channels. This will cause consumers to move elsewhere, or push up costs if customers are forced to make contact through more expensive channels such as the telephone, letters and fax. The research, carried out by multichannel customer interaction management software provider Eptica, evaluated ten leading UK insurers. Repeating research carried out since 2011, it replicated consumer behaviour by measuring them on their ability to provide answers to ten routine questions via the web as well as their speed and accuracy when responding to email, Twitter and web chat. As well as insurers, the Eptica Study also evaluated businesses in nine other sectors, including banking, utilities, telecoms, electronics manufacturers, travel and different types of retail. In 2014, insurance was in the bottom four sectors when it came to answering questions via the web, scoring 57%. Performance has significantly worsened since then, with insurance now bottom for online responses. Its score of 40% meant it had dropped 17% since last year. In comparison, banks managed to answer 91% of questions asked online. The highest web score was 6 out of 10, with one insurer failing to answer any questions at all. "The insurance industry has been transformed by the internet, with consumers increasingly choosing the convenience and speed of digital channels when researching and buying policies," said Julian Sammells, Sales Director UK & Ireland, Eptica. "However, despite this need to be digital-first, the 2015 Eptica Multichannel Customer Experience Study found that the overall performance of insurers is no better than 2014, with wider gaps developing between best and worst. Insurance companies need to target their online investment if they are to win and retain customer loyalty in an increasingly competitive market." 50% of companies were on Twitter, the same number as 2014, and all responded to a question tweeted to their official handle. However just 30% of companies provided a response that answered the question - an identical result to last year. There was a wide range of response times, however with one company answering in 9 minutes and another taking over 43 hours. This led to an average time of 8 hours 52 minutes, much worse than 2014's 37 minutes, and well below other sectors such as entertainment and banking. On the positive side, email did show some improvement from 2014. 50% of questions were answered successfully (up from 30% last year), and the average speed for the sector halved from 40 to 20 hours. Time taken to answer varied wildly - one insurer responded in 57 minutes, another took over 70 hours. The Study also surveyed chat, which combines the real-time nature of the telephone with email's ability to provide a full audit trail. Insurers seem to be slow to adopt it - just two claimed to offer it, and only one had it working when the research was carried out. Finally, the research analysed the number of channels that insurers offered, and how consistent responses were between different channels. This found significant gaps - no insurer was able to answer on all three channels (email, Twitter and web chat), and 20% of companies failed to provide an answer at all on any of them. "While the internet has already radically changed how insurers operate, new technology such as wearables, sensors and in-car telematics may drive even greater transformation over the next five years," said Olivier Njamfa, CEO and co-founder, Eptica. "Building trust and delivering the right customer experience will be central to succeeding in this market, and insurers need to act now to put in place the customer service infrastructure that will allow them to compete in the future." 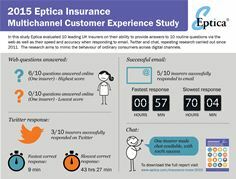 The full findings, highlighting how the insurance sector performed within the Eptica Multichannel Customer Experience Study, along with recommendations for areas to focus on, are available in the Eptica Insurance Guide, which can be downloaded here - www.eptica.com/insurance-mces-2015. An infographic illustrating the findings can be viewed here - www.eptica.com/sites/default/files/uploads/wp/eptica_insurance_infograph_2015.jpg. Do you offer a loyalty discount if I take out more than one type of insurance policy with you? What is your maximum no claims discount? As well as insurers, the Study surveyed websites across the retail, travel, consumer electronics manufacturers, utilities, telecoms and banking sectors in Q1 2015. The full Eptica Multichannel Customer Experience Study report can be downloaded from http://www.eptica.com/mces_2015. Eptica is the European leader in multichannel and multilingual customer interaction management software, covering the email, web, social media, web chat and agent channels. Available on premise or as a Software as a Service (SaaS) solution, the Eptica Customer Engagement suite enables organisations to improve engagement with customers, increase efficiency and drive sales by delivering fast, consistent and personalised responses to their queries, through their channel of choice. The Eptica customer engagement platform is designed around a central knowledgebase, powerful workflow and Eptica Linguistic Services™, advanced linguistic capabilities that enable organisations to quickly understand the tone, sentiment and context of digital interactions and automatically deliver personalised service. Today, more than 400 organisations across all industries and in 15 countries rely on the power of Eptica's platform. They include AXA, Dixons Carphone, Domestic & General, AirAsia, Hastings Direct, L'Occitane, TUI, Debenhams, Capita and Ageas Insurance Solutions. Eptica's continuing innovation and strong performance has resulted in the company's inclusion in Gartner Magic Quadrants for the last four years. In 2014 it was the sole European company in the 2014 Magic Quadrant for the CRM Customer Engagement Center. For more information visit www.eptica.com, connect with us on LinkedIn, follow us on Twitter, Facebook or read our blog.